At first glance, you might mistake Clipboard, the impressively-backed web clipping service, for yet another Pinterest clone. But any similarities are only skin deep. Clipboard’s real rivals are things like Evernote’s web clipper, SpringPad, Delicious, Dropbox and Microsoft’s OneNote. That’s because, explains Clipboard CEO Gary Flake, Pinterest is about expressing an aspiration, but Clipboard is about getting things done. For half a year, the company has been trucking along in a private, invite-only beta. But today, it’s open to all with a fresh redesign in tow and a new button for website owners. 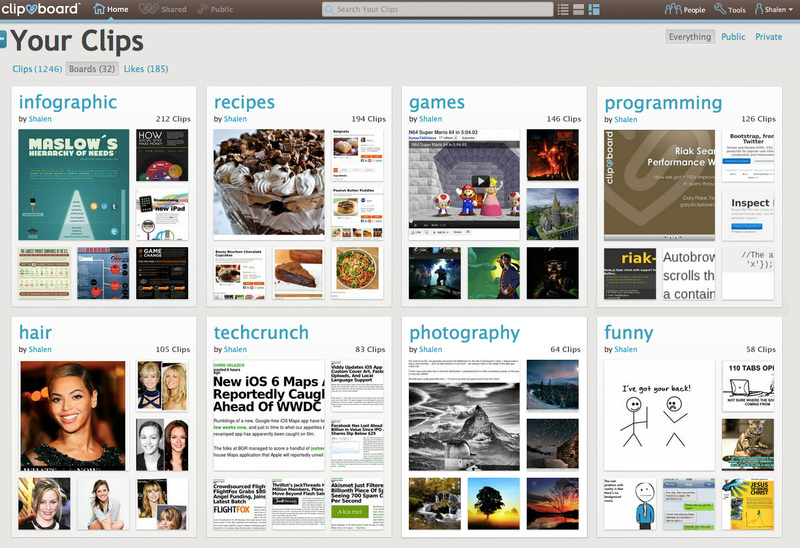 Granted, there are several similarities between Pinterest and Clipboard. For starters, its collections are also called “boards.” And they’re laid out graphically, with a heavy emphasis on the image associated with the clipped content. But Clipboard isn’t just for clipping an inspiring or pretty picture – it can clip all kinds of stuff, including slideshows (like those from SlideShare), audio, a functioning web app (like an online calculator), an online game, and more. And the clips are functional, too. The calculator works, the games play, you can click the links in the copied text. Given the competition, why another clipping service, you may ask? “When you think about how people organize things,” explains Flake, “the thing that has 90% market share is pasting into an email client or Word document,” he says. That is, people’s preferred method for finding and saving information from the web hasn’t evolved much over the years, Flake believes. However, he adds that we’re now seeing the emergence of a new type of service for saving items. This is where things like Evernote or Pinterest come into play. Some of these (like Pinterest) are so simple that they’re more about expression, while others (like Evernote) are “almost accidentally social,” Flake explains. Clipboard is aiming for a sweet spot by being simple, social and functional all in one. Like any good bookmarking/clipping tool, Clipboard’s clips can be private, allowing you to transition from your preferred system, if you chose to do so. In fact, personal use appears to be the favored way to interact with Clipboard, as currently 80% of the beta users’ clips are private. There are also indications of fairly good engagement for a pre-public product. 48% of users are clipping (as opposed to browsing the public clips from others), and the average user has 14 clips. More active users have around 30 clips each. 55% of the clips are also annotated by the user and 20% are hashtagged. (Clearly, some folks were never ready to give up social bookmarking, despite Delicious’ implosion then somewhat fizzless relaunch.) Clipboard will eventually support importing tools to pull in bookmarks from other services, like Delicious, as well as your own browser, which could help some users transition completely from their current systems. Also new today is a developer-facing tool which allows site owners to integrate Clipboard buttons onto their website, so visitors can easily clip and save content. Clipboard, which recently acquired two competitors, Amplify and Clipmarks, is backed by something of a who’s who of startup investors: Andreessen Horowitz, Index Ventures, CrunchFund (disclosure – CrunchFund investor Mike Arrington founded TechCrunch), DFJ, SV Angel / Ron Conway, Betaworks, First Round Capital, CODE Advisors, Founder’s Co-Op, Acequia Capital, Vast Ventures, Ted Meisel (former CEO of Overture and now at Elevation Partners), Blake Krikorian (former CEO of Sling and now an Amazon board member), and Vivi Nevo. Interested users can now sign up to try the revamped Clipboard here.